The first thing you need to understand it is ultimately a “spray and pray” photo. As fast as cameras are, using the option of setting the camera to a predetermined focus spot and allowing the camera to sense the object then trigger the shutter, just does not work. The ball will be in the glove by the time the photo is taken. With that being said, this can also be an exercise to help you improve your timing. Because your timing will help you capture the photo. 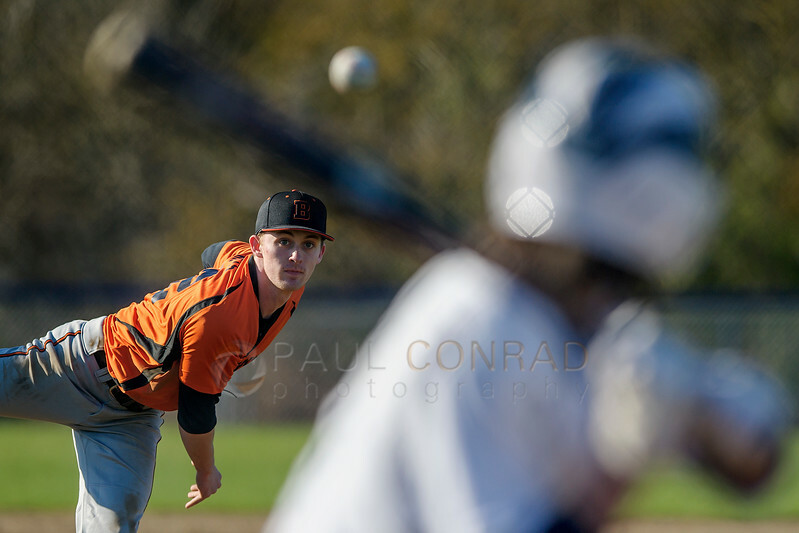 And the key to your timing is watching the pitcher during the windup and release. Your shutter needs to be at least 1/2000th. Your aperture should be at f/2.8 or f/4. F/5.6 will work if need be. Your lens should be at least 300mm to allow for a more compressed scene. Your focus point should be about 1/3rd the distance from home plate to the pitcher. Have a lot of patience. 1. To stop the ball, you need a fast shutter speed. The minimum should be 1/2000th to cut motion blur. 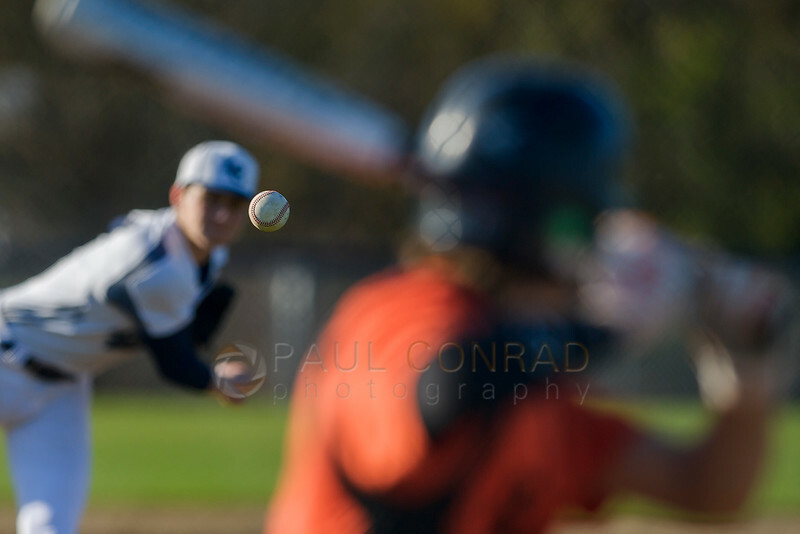 Even though the ball is coming at you, you will still get motion blur so the fastest shutter is required. Adjust your ISO if needed. 2. Having an aperture at f/2.8 or 4 is ideal. 5.6 is OK IF you adjust your ISO to keep your Shutter faster than 1/2000th. X marks the spot. Or close to where you want to focus. See below for reasons. 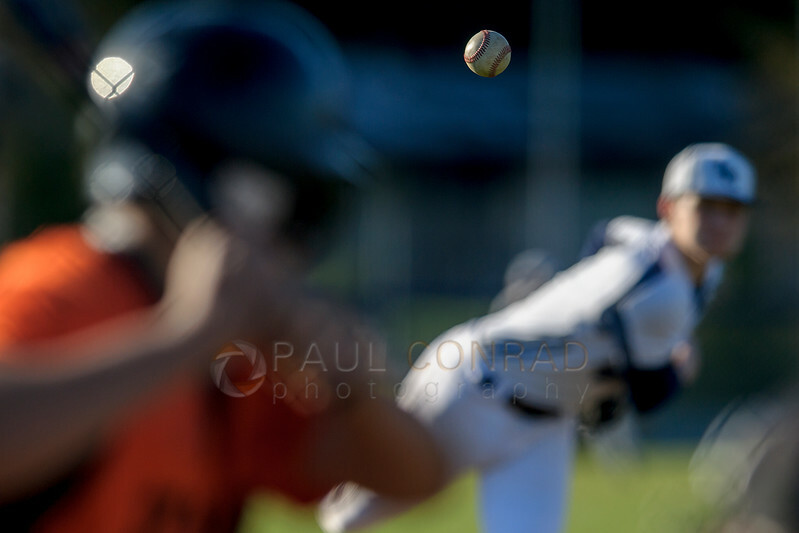 It keeps the batter and pitcher about equally out of focus. Think about how depth of field works: at any f/stop, the DOF is 1/3 before and 2/3rds after the focus point. You can watch the pitcher windup and release thereby giving you time to anticipate when the ball will arrive at the focus point. This takes patience and timing. Each pitcher and pitch is different. 5. 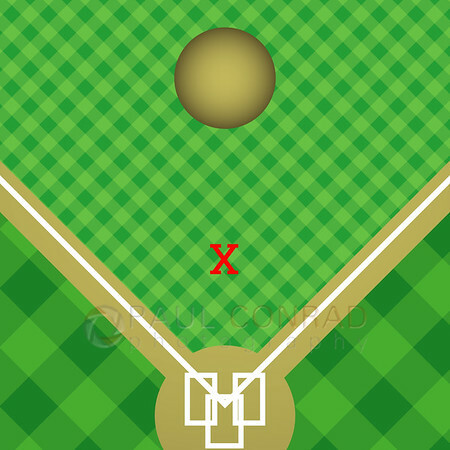 With each pitcher/batter combo the placement of the players is different. You have to pre-compose your shot and then with timing, you’ll be able to get it. 6. Patience. You’ll shoot a lot of duds before getting your timing down and capturing the shot. But now that we have digital, you can burn those pixels and get your shot. And photography, like math, is not a spectator sport. You have to practice, practice, and practice more. 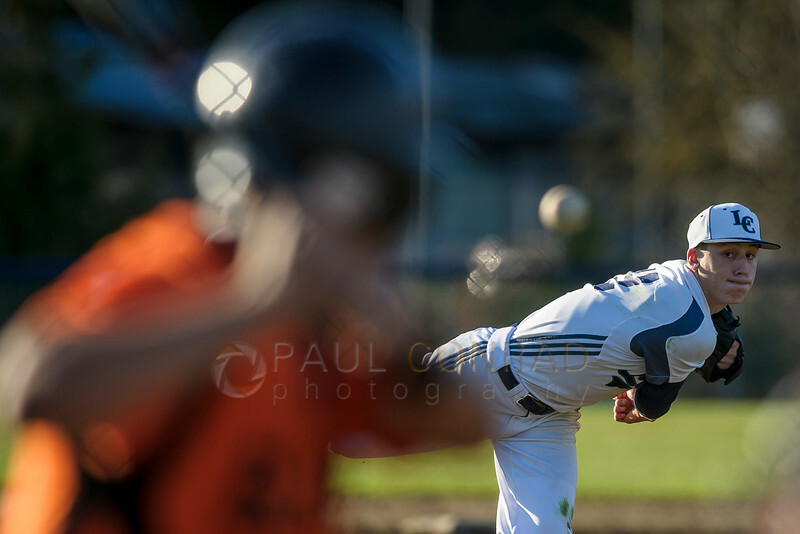 To view more of the images from the game, visit the gallery Blaine defeats Lynden Christian 12 to 5. ← Blazing Glory!! Sunsets in Bellingham, Wash.